Alison Marks’s sculptures, paintings, and textiles often appear gently familiar, but then take a deeper, more troubling turn. SEATTLE — In 2000, a wooden Tlingit bear mask was sent into outer space with an American astronaut, aboard a Russian spacecraft. It orbited the Earth for four months on the International Space Station before returning to its home, in Alaska. I learned of this in Alison Marks’s exhibition One Gray Hair, at Seattle’s Frye Art Museum. The Tlingit artist’s painting “Space Bear” (2017) references this journey with a silver formline rendering of the bear mask and a neon-green, alien-like figure engaged in a surreal dialogue in outer space. The lunar sky and alien form’s sci-fi familiarity at first lent the piece a natural lightness, infused with the optimism of space travel’s portrayals in mainstream popular culture. 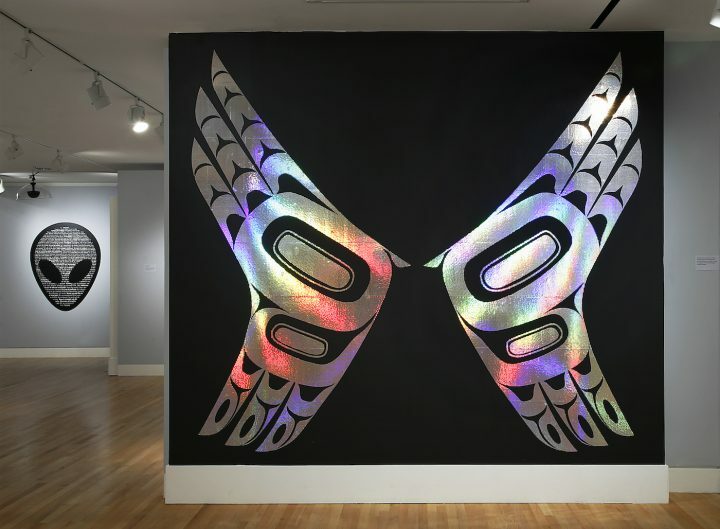 However, after reading the backstory and considering the colonization of the Tlingit people by the US and Russia, the painting’s underlying darkness emerged. I became fixated on the other side of space travel — the fatalities, losses, and loneliness that so often underlay journeys and conquests. The mask started to feel more like Laika, the Russian dog sent into space who only survived a few hours before falling victim to overheating — a captured being, violently taken away from her home, left to wonder how she ended up in a place so unfamiliar and ultimately so tragic. Marks’s sculptures, paintings, and textiles often appear gently familiar, but then take a deeper, more troubling turn. In One Gray Hair — the artist’s first solo museum exhibition — there is a series of digital prints that merges formline design with emojis. The set of familiar animals — a bear, eagle, frog, owl, and wolf — depicted in thick, white outlines backed by bold colors feel almost too easy, at first. Emoji versions of each animal fill in the outlines to create a pixel-like texture that nods to the warmer emotional quality similar animals add to text messages — a quality so easily lost in digital conversations. However, in nearby text, Marks describes the Tlingit language as “critically endangered,” expected to lose all fluent speakers by 2030. In this context, the formline emojis lose their buoyancy. I wondered what digital conversations would look like with more influence from Tlingit perspectives and imagery, if Native American languages were better supported by technology rather than pushed towards extinction. Marks employs unexpected combinations of materials as she probes these questions. The sculpture “Text Me” (2017) is comprised of two carved panels made from cedar, latex, and artificial feathers, connected by thin strands of plastic beads. 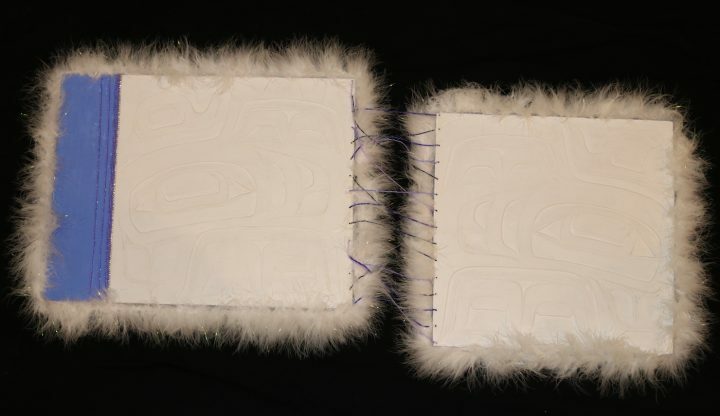 Coating formline carvings in white and adding synthetic details brings out the mass produced quality we associate with cheapness, particularly in contrast to the fine woods more typically used in traditional Native American works of art. Yet, plastic is undeniably durable, giving it an eternal advantage over wood’s natural process of decomposing over time, prompting questions of what sacrifices are acceptable when survival is uncertain — do new materials reworked with traditional methods sustain culture in a way that lasts without losing its original values and meaning? While I found few answers to my questions, a number of Marks’s textiles offered more tangible responses to the weight of a culture struggling to survive the present and more hopeful visions of what it means for that culture to persist. “Chemically Tanned” (2017) hardens her clan’s traditional body-length, animal-skin dress, creating a shell-like sculpture molded around the female body’s contours. Painted in varying skin tones, with legs and arms splayed as if positioned beneath a microscope, the garment exposes a wrought emotional state through the tension of the fabric’s folds, demanding onlookers to simultaneously look and look away. More optimistically, an electric-blue, holographic version of traditional dance regalia, Zenon (2017) interrupts the quiet gallery space with the sense that traditional garments can take on bold, new lives that integrate present and past with seamless cohesion when both are recognized and invited into the conversation. One Gray Hair instigates an urgent conversation about the perspectives that are lost in a monolithic world, with questions and answers moving fluidly between the work, the viewer and the artist. I’ve since found myself wishing the commonplace communications I experience in a day — the two-sentence emails, the three-word text messages, the single emoji reply — had such emotional resonance. If Marks’s wisdom is as thoughtfully heard as it is expressed, such an aspiration is within reach. Alison Marks: One Gray Hair continues at the Frye Art Museum in Seattle, Washington through February 4.